My story begins, as many do, in my childhood. I started gaining weight at an alarming rate after being molested by a family member. My weight went up and down, but I was always on the heavier side. I used food to soothe my emotions and continued this behavior my whole life. I was the typical dieter who lost 20 pounds only to gain back 30. I dieted my way up to 320 pounds. I was desperate. No matter how I tried or how much I wanted to, I could not lose weight. Weight had now become a major force in my quality of life. I struggled to get through a shower without exhausting myself. I could barely tie my shoes. Getting into a plane seat had become next to impossible. In a last-ditch effort, I had a vertical sleeve gastrectomy surgery to reduce the size of my stomach. I thought I had finally won the battle as my body shrunk quite rapidly down to 215 pounds. Then the weight loss came to a standstill. I started gaining weight back, and in a few months was back up to 245 pounds. I searched the web and found diet after diet, but knew from my lifelong experience that diets didn’t work. Then one day I stumbled onto the Protective Diet Living Facebook page. Reading the posts, I came to realize that this wasn’t a “diet” at all. People were changing their eating habits and lifestyles completely. It appealed to me but I didn’t really believe it would work for me. After all, nothing ever had in the past. This “diet” was completely different than anything I’d ever tried before. It was a whole food, plant-based diet that completely avoided added oils, sugar, nuts and food additives. I had dabbled in vegetarianism and veganism several times in my life, mostly for the animal’s sake. I had never really done it for my health before. I came to realize that this was a plan about health, not about losing weight, and that losing weight was only a side effect of following the guidelines of the plan. According to Julie Marie and Jerry Christensen, I could achieve all of my health goals by following this plan. Of course I didn’t really believe it. After all, I’d been told this a hundred times before on so many of the eating plans I’d tried in the past. I started changing my eating habits in 2014, sticking to the Protective Diet about 90% of the time. 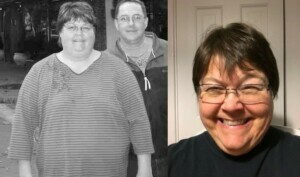 I did this for about a year and managed to lose 25 pounds. I was pretty happy with that, but I still weighed 220 pounds and had a long way to go to reach what I really thought was an unattainable goal of around 150 pounds. It was then that I had one on one sessions with Jerry, with Julie always by his side giving me advice and cheering me on. It was after these sessions that I really believed that the goal was attainable, and that I could do it. But I still had my food addictions and could only maintain about 95% adherence to the plan. I was still drinking a lot of beer, which lowered my inhibitions and caused me to eat junk vegan food that was full of oil, sugar and food additives. I knew I needed to commit 100% as Julie and Jerry were saying in order to fully receive the health and weight goals I had for myself. At this point in time, I was living in Salt Lake City and had lost another in a long line of jobs due to projects that got cancelled or were completed and my services were no longer needed. I’d been moving from job to job, state to state for years at this point and was tired of the whole thing. At the same time, my sister’s husband passed away in New York leaving her alone in a big house. I made the decision to leave my line of work and move back to New York to live with my sister. I figured we’d be able to help each other out and by that time I’d determined that I wanted to finally settle down and stop the constant moving I was doing. So in March of 2016 my sister and I drove to New York together. I was still eating about 95% of a Protective Diet, but the closer I got to New York the stronger my feeling of determination about finally going all in and making the final lifestyle change to 100% on plan became. As I crossed the border between New Jersey and New York I had committed to never letting myself down again, as I had so many times in my life. Not with one bite. Not with one sip. We stopped at a Starbuck’s on the New York State thruway and I got an unsweetened iced tea instead of my usual venti Frappuccino. I have now been in New York for almost 5 months and I have not let myself down once. I have already lost another 30 pounds and am continuing to lose at a steady rate. I eat all I want of on plan foods, most of which are recipes that Julie created and that are available on her website, www.protectivediet.com either as free recipes or available as a Protective Diet Education member. I’ve found the support on the Facebook Protective Diet Living page and as a Protective Diet Education member invaluable in keeping me focused on my goals. The support from the other members has kept me going when times have been stressful. I got through my 30-day detox and no longer had any food cravings for the first time in my life. What an incredibly freeing feeling to not be a slave to food, but rather to be nourishing my body and improving my health. I started out as a morbidly obese person, got down to obese, and am now just considered overweight at my present weight of 190 and dropping. I no-longer have high blood pressure and my cholesterol has gone from about 250 to 165. I had had a heart attack about 10 years ago and will soon be heart attack proof once my cholesterol gets below 150. I was diabetic but am thrilled to say I no longer am and that my sugar numbers and A1C are in the normal range again. I went from a size 34 to a 14 and even fit into a couple of size 12 shorts. The Protective Diet has and continues to save my life. I am part of a community of like-minded individuals who have already reached their health and weight goals, or like me, are well on their way. I can’t imagine ever going back and eating all of those foods that I was addicted to my whole life. I have found freedom. So this is who you are! I see you on PDL. Thank you for this amazing story. It is so encouraging! I love that you kept trying and got the help you needed when you were stuck. And using the State line as your line was brilliant! And thank God for sisters! Wow! Thank you, Jane. This was so encouraging. So proud of all that you’ve accomplished Jane! Way to go, Jane! You’re such an inspiration! Jane, Great testimonial! I think of you often with “not one bite”! !